Team ippi: (Back row) Me, Jesse, Doug, Tam, and Jon; (Front row) Jimmy and Sam. 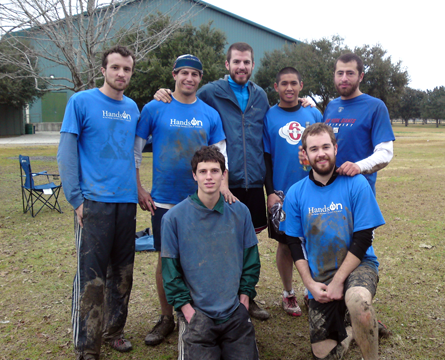 Team ippi is the Mississippi Gulf Coast’s only ultimate frisbee team. Now, I’ve been playing Tuesday night pick-up ultimate since I arrived here in Biloxi in the fall of 2007. That game, which was started through friendly competition between volunteers from Habitat for Humanity and Hands On, is still going strong 5+ years after Hurricane Katrina. But it’s a non-competitive, casual game full of beginners as well as skilled players. This January, for the first time, Biloxi’s ultimate players decided to try to find a tournament and put a competitive team together. We signed up for the Abita Savage 7, which was hosted by LSU in Baton Rouge, Louisiana on January 16-17. The tournament included around 17 open teams and 9 coed teams. Most of them were club teams from universities including Rice, Southern Miss, Alabama, LSU, Louisiana Tech, and Tulane. 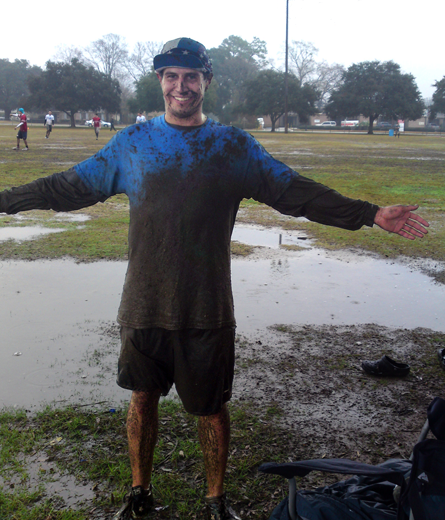 In addition to the tough competition, we faced rainy conditions that turned the fields into mud throughout the day on Saturday. Team ippi emerged with a losing record, but we had a great time and put up a good fight in most of our games. In fact, everyone did really well considering we’ve never had an official team practice. With more practice, we’ll develop some offensive and defensive strategies and skills and should be in great shape for the next tournament that comes our way. Team ippi… Where did your team naming creativity go? Still playing on Tuesday nights?